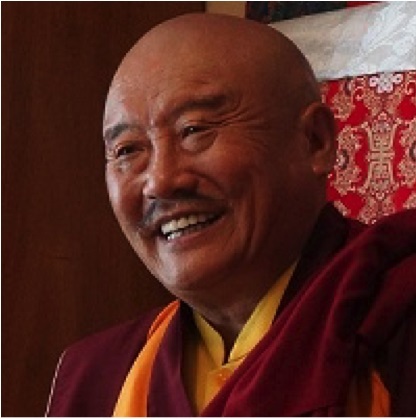 Lamchen Gyalpo Rinpoche, teacher to many lamas and tulkus in the Drikung Kagyu tradition, has entered Parinirvana, Sunday evening around 8:30 PM EDT. Lamchen Gyalpo Rinpoche was born in 1939 in the Nangchen region of eastern Tibet as the reincarnation of Lama Phurga (1883-1938). Lama Phurga was famous for his ability to see into a person’s past, present and future lives. After his death, the search for his reincarnation began with the submission of candidates’ names to His Holiness the 34th Drikung Kyabgon, Shiwai Lodro. His Holiness wrote down the zodiac signs and birth years of the parents and the new Tulku. For the location of the family, His Holiness the 16th Karmapa found in meditation the name of the mother. H.E. the Tai Situ Pema Wangchen wrote a letter to the father of the new Tulku. At the age of five, he was enthroned as a Tulku in accordance with prophecies and started traditional Buddhist training in Lo Lungkar Gon monastery. Besides his root Guru Khunu Rinpoche, he also acquired teachings from the Nyingma, Kagyu, Sakya, and Gelug schools with numerous precious masters. But Rinpoche did not only receive these precious transmissions, he practiced each teaching without error from the beginning to the completion stage. Therefore Rinpoche is a complete repository for the blessings and teachings of the Lord Buddha and a true vehicle for freeing sentient beings from the grip of samsara. In 1961, Rinpoche went into exile in India. In 1985 he established Jangchub Ling in Dehradun, India to serve as the seat for His Holiness Drikung Kyabgon Chetsang Rinpoche and proceeded to serve as his private secretary. During a global teaching trip in 1986, His Holiness Drikung Kyabgon Chetsang Rinpoche bestowed the title Lamchen-pa (knower of the path). As His Holiness ’s private and general secretary he worked with His Holiness on the history of the Drikung Kagyu tradition. Lamchen Gyalpo Rinpoche received teachings from many profound masters and practiced them all from the preliminary stages to the arising and completion stages, punctuated with three major retreats and propitiation of deities. Later he established several Dharma centers in the United States and Taiwan. For the past years Rinpoche has been busy traveling around the world to share his extensive knowledge of the Dharma to his many students. I had the opportunity to receive empowerment and teachings from him and I was very impressed. His presence, knowledge, explanations and the way he showed care for his students left a real impression on me. A great lama, his passing is truly a loss. Amazing photo, thanks for sharing, he sounds wonderful.